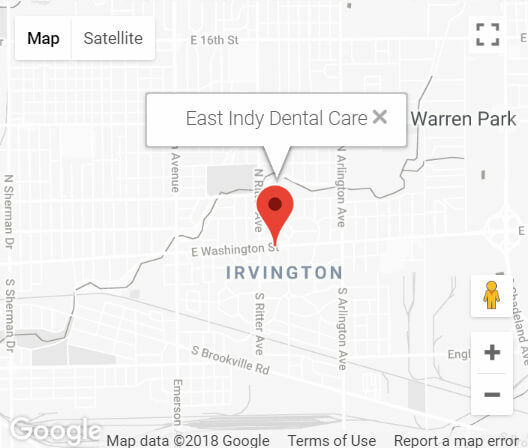 The Best Emergency Dentist Indianapolis Has To Offer! As we strive to be the best emergency dentist Indianapolis has to offer, we understand that dental emergencies don’t ever happen when it’s convenient. In fact, many of them happen when you are out of town, over the weekend, or even at the end of the day when you least expect it. Thankfully we offer emergency dental services right here in Indianapolis to get you pain-free and smiling again as quickly as possible. Dental emergencies can happen in an instant, and the timing seems to be always inconvenient. At East Indy Dental Care, we realize that a broken tooth or a toothache can hurt horribly and make your life miserable. We are here to help. Dental discomfort can be due to a variety of reasons, but in order to know exactly what is causing your pain, you need to consult a dentist ASAP. Whatever the cause of the problem, when you need an Emergency Dentist in Indianapolis, we are right here for you. How can you be sure that your dental problem is really an emergency? First, ask yourself: Are you in pain? Is it keeping you home away from work or school? Did something happen that makes it embarrassing to smile or impossible to eat? If you answered “yes” to any of those questions – then it is a dental emergency and you need to call our Indianapolis dentist right away. Any injury to the teeth or gums should never be ignored. Doing so increases the likelihood of permanent damage or more costly treatment later on. It’s best to act quickly, and call a dentist immediately. Below is a quick summary of how to handle some of the most common dental emergencies. Toothache: Rinse your mouth thoroughly with warm salt water and remove any food that may be lodged between teeth with dental floss or air/water flosser. If there is any swelling, a cold compress can be held on the outside of the mouth or cheek. Do not ever hold any painkiller, such as aspirin, directly against the gums near the aching tooth as doing so can burn the gum tissues. Call our office to receive emergency dental care in Indianapolis as soon as possible. Chipped or Broken Tooth: Save all pieces of the tooth. Place into a small container with milk, preferably, or lightly-salted water if milk is not available. Rinse mouth with warm salt water. For minor bleeding, apply gauze to the spot for about 10 minutes. A cold compress near the area should help relieve swelling and pain. Visit dentist as soon as possible. Knocked-Out Tooth: When a tooth is knocked out, it’s a true dental emergency. The best chance of saving the tooth is to see an emergency dentist within one hour. Hold the tooth, without touching the root, and rinse off if dirty, but do not scrub or remove any tissue fragments that are attached. Try to reinsert tooth into the socket, facing the right way, but do not force it. If this doesn’t work, put the tooth into a small container of milk. Use lightly salted water as a second option. Visit an emergency dentist immediately. Partially Knocked-Out or Dislodged Tooth: This dental emergency also requires immediate care in order to save the tooth. While en route to the dentist, hold a cold compress to the area near the tooth. In some cases, chipped tooth fragments can be bonded back on the tooth, but more likely your dentist will need to place a tooth colored filling or a dental crown to reconstruct the tooth. This primarily depends on the severity of the injury. Food or Object Stuck Between Teeth: Gentle use of dental floss may remove or dislodge the object that is causing discomfort. Air and water flossers do a fantastic job of removing any food particles that are caught between the teeth as well. Never try to remove an object with something sharp, such as a pin, as this could greatly damage the teeth or gums. Lost Crown: Save the crown to bring with you to your dentist. If it’s impossible to visit an emergency dentist in Indianapolis immediately, try to fit the crown back onto the tooth. To provide some adhesion for the crown, coat the inner surface with toothpaste, denture adhesive, or an over-the-counter dental cement. Never use superglue! Lost Filling: The filling can be temporarily replaced with over-the-counter dental cement or a bit of sugarless gum. Do not use gum with sugar as this may cause pain. Arrange to visit your dentist in the near future. Abscess: An abscess can be a very painful infection occurring either inside of the tooth’s nerve or between the tooth and gum tissue. This is a serious condition requiring immediate treatment as the infection can not only damage teeth and gums, but spread to other parts of the body, such as the heart. Rinsing the mouth several times a day with warm, lightly-salted water can temporarily reduce pain and draw pus to the surface. Generally speaking, there are over-the-counter products, such as ibuprofen, benzocaine, etc. that can aid in relieving some of the pain, but don’t let the temporary relief fool you. The tooth hurts for a reason and those products just cover it up for a short time. The tooth still needs to be looked at by an emergency dentist in order to best care for it. Call us at (317) 375-2273 to schedule an emergency appointment!